Originated in Indonesia, satay is a widely renowned in almost all regions of the country and is getting more popular arround the world. It is considered to be a national dish and one of Indonesia's best dishes. In Indonesia, satay can be obtained from a travelling satay vendor, from a street-side tent-restaurant, in an upper-class restaurants, or during traditional celebration feasts. 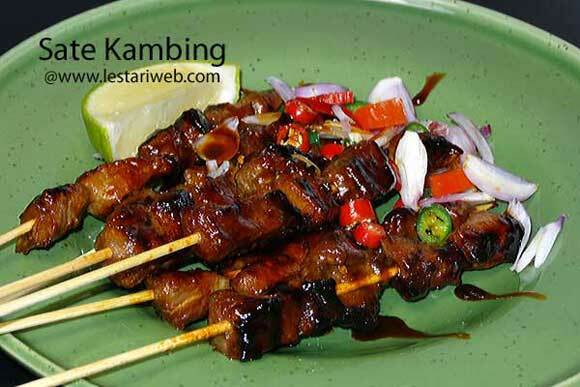 A famous variant among them is "Sate Kambing", it is popular in Java, made with goat, lamb or mutton. To be served either with Peanut Sauce or Sambal Kecap, an Indonesian relish made from sweet soy sauce, chilli, sliced shallots and diced tomatoes. In his homeland, goat is more popular than lamb/sheep due to it's mild flavour. Eventhough most of indonesian satay sauce are made from peanut paste as basic ingredient, however seasonings or spice will vary slightly by region. 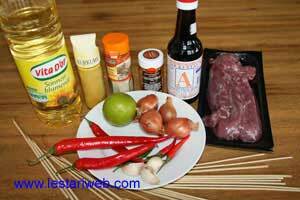 The main characteristic of Sate Kambing is the composition of Coriander, Turmeric & Cumin for marinade ingredients. This is one of my husband's favourite as well as our extent family & friends in Germany. According to them the marinade tastes so delicious with the touch of curry flavor. ( Note : Curry Powder is based largely on five spices: turmeric, coriander, cumin, cardamom and cloves). 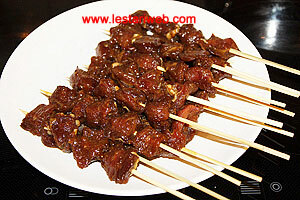 For you who are keen of Indonesian Satays, you can also try Sate a la Madura or Sate Ayam Jawa. Tips : Soak the bamboo skewer in a cold water for about 30 minutes before using to prevent burning during grilling process. 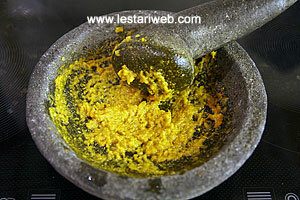 For Sate Marinade: Put all ingredients for the paste in a mortar / grinding stone and grind until smooth. 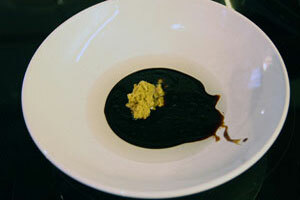 Transfer the paste into a bowl, add the kecap manis & oil. Add the lamb pieces. Stir to mix. Let stand or store in the refrigerator for 2 hours to allow the flavors to blend. 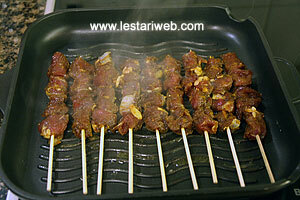 For Satay: Put about 4 - 5 cubes of lamb on each bamboo skewer. Put aside. For Peanut Sauce: Blend all ingredients for the sauce in a food processor until smooth. (If necessery add a little bit hot water to help the blending process). Put in a saucepan & add the peanut powder or pindakaas. Add the hot water & kecap manis. Stir to mix. Adjust the taste, if necessary add salt or sugar to taste. Grill the satays on charcoal or under electric / gas grill /pan grill. Turn them over to grill the other side until both sides half / well cooked as you prefer. Lift. 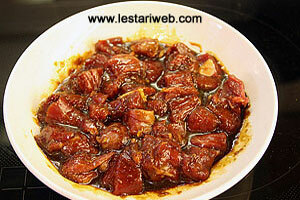 Serve hot with peanut sauce or sambal kecap , rice or compressed rice/lontong. Garnish with chopped bird chillies and shallots if you like it SPICY!!. If using raw peanut: Fry or roast the peanut in a hot wok until brown then blend in a blender into a smooth powder. If you prefer a short cut method by using Pindakaas ( Dutch peanut butter), you can use it right away.